One of the reasons why I loved my trip to Malaysia was getting to try so many new dishes. This hawker stall, in front of a kopitiam (a kind of coffee shop/hawker cafe) on Gurney Drive (a.k.a. 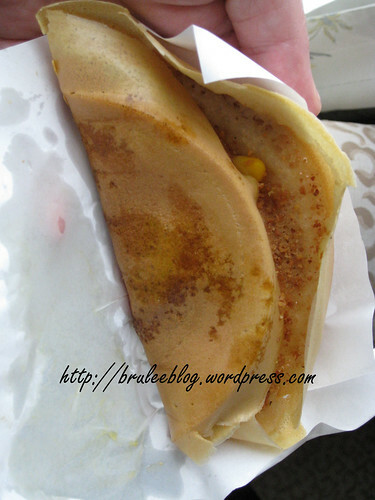 Persiaran Gurney) in Georgetown, Penang, Malaysia, served pancakes stuffed with various sweet and/or savory fillings. The dough is cooked into a thin, crepe-like skin (but crispy), filled, and folded like a taco. The traditional filling is creamed corn and peanuts, but now you can buy it filled with ham, chocolate, bananas, tuna, etc. It was fascinating to watch the vendor at work, and I took a video of him cooking my corn and peanut order. We didn’t see him at his spot every day; apparently he actually set up shop elsewhere in the morning, and only showed up on Gurney Drive after lunch if he had ingredients left over. Many areas of Asia tends to treat corn as a dessert (in one shopping mall I saw an ice cream stand that also sold fresh corn on the cob). I’m not usually a fan of this, but I have to say, creamed corn and peanuts are a surprisingly good combination. An additional photo and a video after the cut.